Have you ever noticed that most of our favorite pictures of Ireland’s scenery are grass-covered hills with stone walls and sheep, but hardly any trees? The more I looked, the more I wondered if I’d be able to handle a land without forests. But Ireland has forests! According to one site, Ireland had only 1% forests a century ago. The Irish Forest Service has been planting managed forests, and when they got to a third of a million hectares (however that translates into acres), the company Coillte was formed. Coillte (sort of pronounced Kweelcheh) now privately owns most or all of the harvested forests, which have walking trails and recreations spots in the “forest parks” which are open to the public. Other forested land is owned by farmers, and the total is now up to about 10%. If you want a long hike, head for the waymarked trails. But for shorter adventures, you can head for the forest parks and walk the paths there. 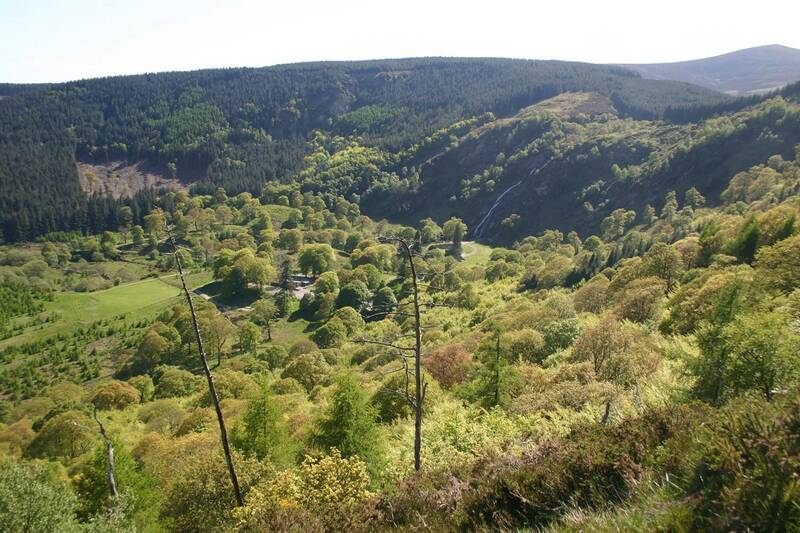 Check out the Coillte Outdoors site–click on a county and then a recreation site for details. Fun to browse and anticipate, and I love names like Castlemartyrs Wood and Ballaghisheen. Some are just the woods, lakes & streams, but some, like Gragans Wood in County Clare, have ancient forts, castles, and cairns as well as the flora and fauna. Read the comment below, and click on the links to the articles. Selling off nationally owned forest land is NOT the way to solve budget problems! This entry was posted in IRELAND and tagged forests, hiking, IRELAND, Irish forestry, trails, walking, waymarked ways. Bookmark the permalink.